1. Preheat oven to 250 F.
2. In a small sauce pan, whisk together oil, maple syrup, brown sugar, and salt. Heat over medium-low heat until sugar and salt dissolve. 3. In a large bowl, combine oats, seeds, and cashews. 4. Pour the oil mixture over the oat mixture and stir to coat. 5. Spread evenly on a parchment paper-lined baking sheet. 6. Bake for 1 hour, stirring every 20 minutes. 7. 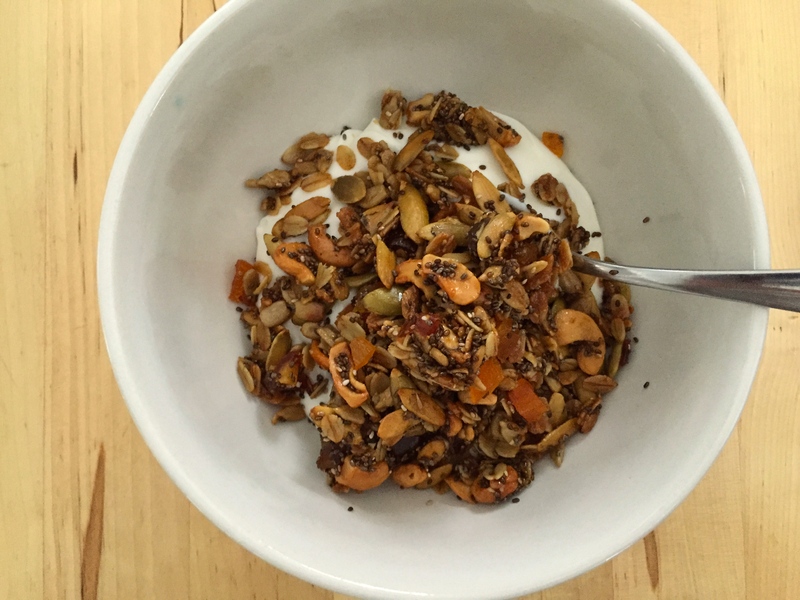 Combine granola with dried fruit and cool, stirring occasionally to break into smaller clusters. Notes: decrease both oil and chia seeds to 1/4 cup each. Otherwise, flavor was great and texture was what I had hoped: crunchy with some larger clusters throughout. Yum. Could probably decrease sweetness (try 1/4 cup maple syrup). 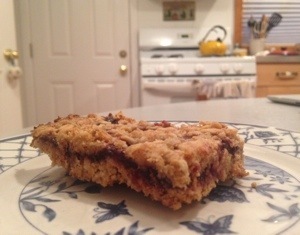 Adapted from a Bob’s Red Mill recipe for Raspberry Oatmeal Bars, I made it vegan by swapping coconut oil for the butter. I didn’t have oat flour on hand and instead used whole wheat pastry flour, so it is not gluten-free. The reviews stated that the recipe was on the sweet side, so I used a bit less sugar than called for in the recipe. 1. Preheat oven to 375°F. Generously grease an 8×8-inch pan with coconut oil. 2. In medium bowl, combine melted coconut oil and vanilla. Stir in flour, oats, sunflower seeds, sugar, baking powder, lemon zest, and salt until thoroughly blended. 3. Press 1 cup of oat mixture firmly into bottom of the prepared pan. Spread jam evenly on top. 4. Sprinkle remaining oat mixture over jam, then gently press. 5. Bake 20-25 minutes or until top is lightly browned and firm. Cool bars in pan for 30 minutes on wire rack. Cut into 16 squares and serve at room temperature. Notes: for some strange reason, these bars tasted better as they sat. 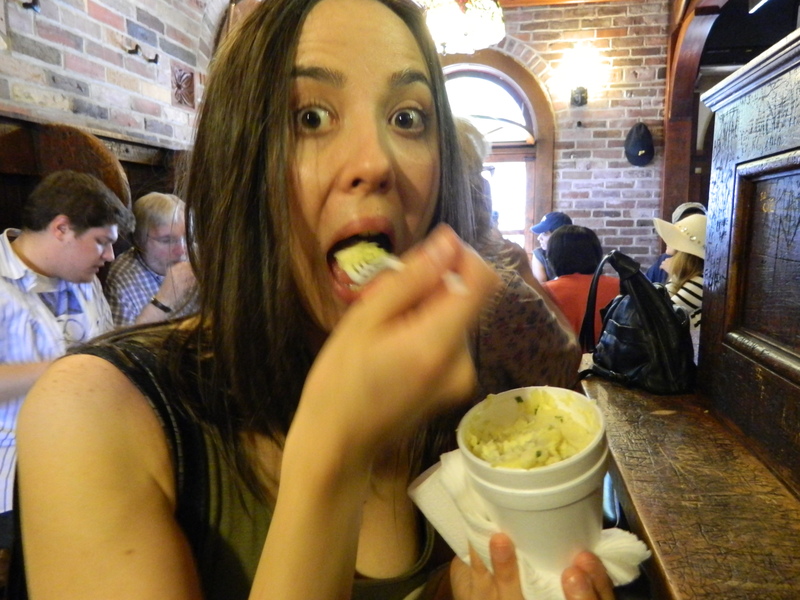 The coconut flavor mellowed and it somehow tasted sweeter a few days later. I made these oatmeal bars using this recipe. Swapped the raisins for chocolate chips, since that’s all I could scrounge up in the pantry, but honestly, I think these would fare best with dried fruit. 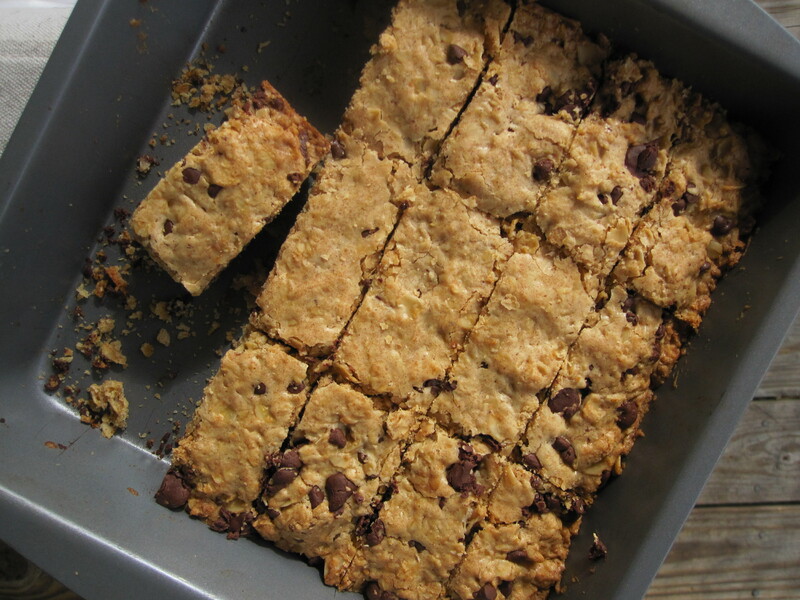 More appropriate for breakfast than dessert, make these hearty bars to enjoy with your morning coffee. I will be experimenting with these oatmeal bars, trying to make them healthier so that you’ll feel good about how you look in those little undies.